Based on TE 1.7.x , if not otherwise declared. You want to make your own track for GP2, and you see the TE (track editor) of Paul Hoad and start immediately. But after a short while you realize its not easy going because a GP2-track is a (very) complex object with different tables and other data. And you have to do a lot of things until you can drive the first time on your own track in GP2. Actually it is hard work and needs a lot of time (and nerves) to make a new track. And the bad news is: nobody can change that. But we can try to provide as much information as is available. These days there is a lot of knowledge around about track editing and debugging, but unfortunately it is wide scattered. And there are still secrets. This is a try to make a summary of all knowledge how to deal with GP2 tracks in general and the track editor of Paul Hoad in particular. I collected the knowhow at the beginning out of any tutorial i could get my hands on, then i had to find out a lot of things by myself. Over the last few months i also watched the track-editing-forum and collect the posted know how. People that mainly started me off with or without knowing about it: Paul, Ando, Ponk and of course Norman Surplus with the making of the original tracks (very hard to beat, honest compliment!). These days i'm working together with several people, they are named in the tutorial, where they got the most influence. All mentioned tutorials are available from the tutorials-page of the track-editor homepage. 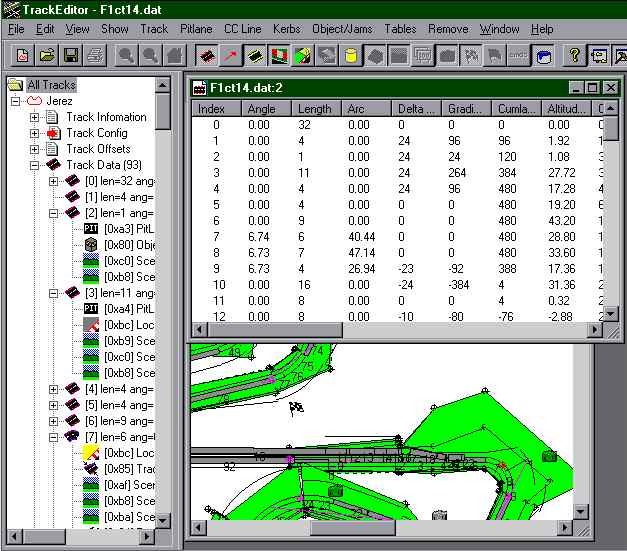 The track is defined by a lot of sectors that are stored in a table called track-data-table (to be found in the "Track" and the "Tables"-menu). By doubleclicking an entry of this table there shows up the track-change-dialog where you can define all the parameters of a single track sector. A single track sector has a length ("Length"), a constant curvature ("Angle") and a constant gradient change ("Height"). In the track change dialog you also can define the verge width at the end of the sector, you can enable road signs and kerbs. There are also some more things there that we examine later. The track sectors also can be accessed in the track-tree. If you open the track-data, you see the list of all the sectors of your track. You notice a sector can be opened in the track-tree too ! (But you may not want to work in the track-tree AND the track-data-table at the same time, because the TE seems to be not very stable here) If you open the sector you see, that there are more or less commands belonging to the several sectors. There exists a library of descriptions of all these track commands, collected and formatted by the same author. In the following picture we see the track-tree on the left and the track-data-table and the track-view on the right. Another important subject is the pit lane. Basically the pit lane is defined similar to the track, with one litte difference: while the two ends of a track are always connected, the two ends of a pit lane are connected to the track somewhere. But this is a story by itself, and it is in details described in another tutorial of the same author ("the guide to pit lane editing"). Once we have the track and the pitlane we can say our track is basically working. The next thing will be the scenery and the objects and the textures, because we not just want a working track, but we want a NICE (and working) track. The scenery is mostly defined with track- and pit lane commands. Details about dealing with the scenery can be found in the scenery- tutorial of Martijn Keizer. The objects are defined by object tables and placed by track- and pit lane commands. You find a tutorial on objects by John Verheijen. The textures are defined in JAM-files and placed with track- and pitlane commands. Last but not least we have to make the CC-line. I suggest to wait with developping the CC-line until the track is nearly finished. Because once the CC-line is made, it is close to impossible to change something at the track-layout without loosing the CC-line. And as developping a good CC-line means a dozen or more hours of hard work, we dont want to loose it anymore. We just may want to replace it by a better one. If you intend to make a completly new track layou, you may want to do a "CC Line / Straighten CC-Line" first. In general you may want to start track editing by having a closer look at existing tracks. By making experiments with the several arguments in the track change dialog you will more and more get a feeling for what is going on. And you may want to make often backups of the track you are working on. It may happen that the TE cant load your track anymore, or in certain conditiones a certain function can mess your track completely and definitely up. then you probably will HAVE to go back to a backup. Most people of the track editing community experienced this (me included). For your own track, you have to start with an existing track as base. Making a new track from the scratch is not possible yet. Choosing the right base can be important. Basically i would suggest to choose the track that comes closest to "your" track. First lets have a look at the track change dialog. Here we can define the track- and also pit lane sectors. 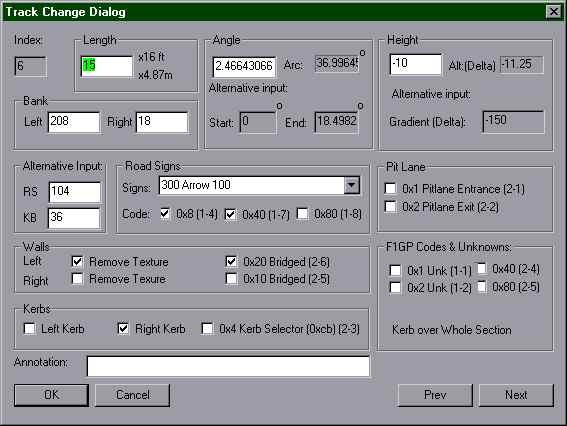 Most of all we can set up the geometry and enable/disable features like kerbs and road signs. As mentioned before we can call the track change dialog out of the track-data-table or out of the track-tree. When we first concentrate on geometry, we may want to use the table, because in the table we also find useful additional info on our track sectors. If we do deal with features and commands, we may prefer the track-tree, because THERE we have the commands. After finishing the track we also may want to have a working pit lane. How to do it is described in the pitlane tutorial of the same autor, so we do without it here. Basically dealing with the pit lane is similar to dealing with the track. The difficulties start when we want to connect it to the track. A big chapter is the work on the scenery. With scenery we mean the space on the other side of the fences. Basically we have some ribbons that can be formed to look like hills or dips or flats or whatever. The scenery is most of all controlled by track commands. The details can be read in the scenery-tutorial of Martijn Keizer. In the following picture we see a very nice example of what can be done with scenery. It is a screenshot of the Sepadelft-track of Martijn Keizer. In this picture we also see, where the scenery ends, and maybe we get an idea of how scenery works. Martijn worked with but one ribbon on each side, placed some objects and mapped some textures in a very efficient way. We now have defined a lot of areas, track, verges, fences, banks, ribbons, etc. As already mentioned the next thing we want to do is mapping Textures on them. Thats when they start looking good. To have an idea of what textures are, you may want to go into the graphics-options-screen in the GP2.exe and disable all textures and then have a look in the GP2. Last but not least we want to spend some 15 or more hours by developping a good CC-Line. The CC-line is the driving line that will be followed by the CC-cars and the steering help for keyboard drivers. So if there is no CC-line, there will be no races against CC-cars (at least not very long ones) and no reasonable keyboard driving on the track. In this dialogbox you see some editfields and a load of checkboxes. With the editfields in the boxes Length, Angle and Height you can control the geometry of the track sector. Length is length, the angle and the height are a kind of curvature (german: krümmung). 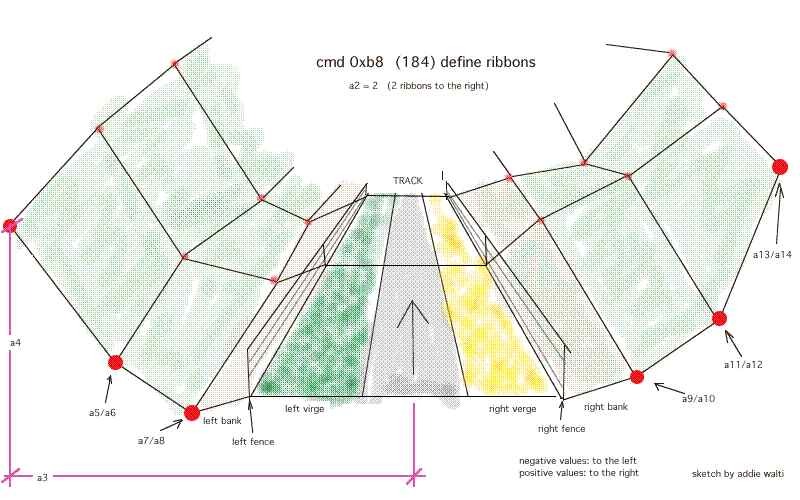 More to these parameters in the chapter Track Geometry. In the Verge section there are two fields for editing the verge wisth. The verge is the space between the track and the fences along the track. Thats where we always get lost in gravel traps or loose the frontwing when hoppling through the grass, or sometimes when we are lucky, there is also tarmac and we can make a power turn and rejoin the race again. With the two editfields we can control the distance between the track and the fence. See the chapter Verge Width. by Nic "Swervin' Irvin'" Prins later in this tutorial. Next we have a section "Road Signs", see the chapter Road Signs. later in this tutorial. The section "Fences" features the checkboxes used to bridge fences. See chapter Bridged Fences later in this tutorial. The checkboxes of the "Pit Lane" section are described in the pitlane-tutorial, that you also find in the tutorials section of the track editor homepage. Next we have a Kerbs section, where you can choose whether you want kerbs or not. See the Kerbs-Tutorial by Nic "Swervin' Irvin'" Prins for how to deal with kerbs. 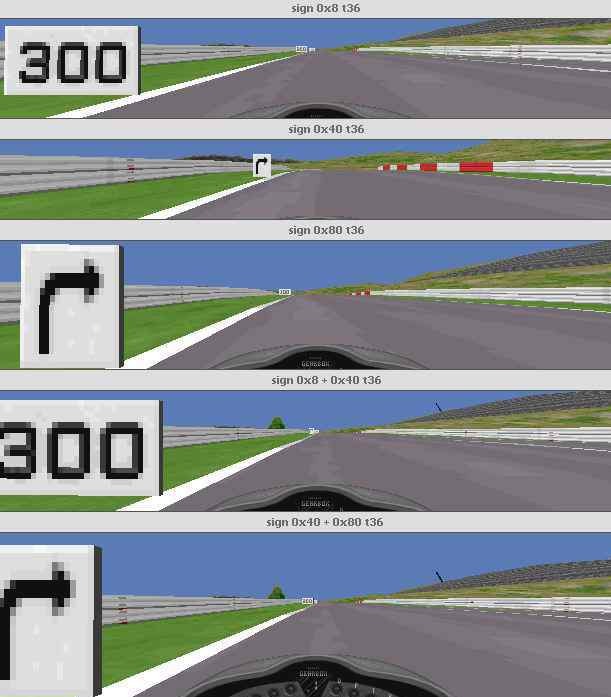 Last but not least you see two editfields RS (Road Signs) and KB (Kerbs). These two fields are the container for all the checkboxes. If you check or uncheck a checkbox you will notice one of these fields also changing, and vice versa. That means you have the choice: you may either do it the hard way and edit the numbers or you may do it the little less hard way and deal with the checkboxes. In the track-change-dialog we saw, where we can control the track geometry parameters. Now we all wonder about their meaning. Length is easy to understand. We only wonder about the UNIT. Looking at the original tracks, the unit is somewhere between 4.80 (jerez) and 4.97 (silverstone), ever, this can be determined by dividing the real length of the tracks (as given in the GP2-manual!) by the number of length units of their GP2-pendants (but watch out in adelaide!). Because Geoff Crammond is british, we have a look at the british length system. After a short while we see that 16 feet (1 foot: 30.48cm, at least my english dictionary says so) are 4.877m, bingo ! I guess this is obvious enough. Paul first mentioned this fact somewhen in the forum, but doubted it later again. Now addie says: 1 unit ALWAYS means 16 feet (about 4.877m). Its a pity we have to deal with such a wide grid. Sometimes we wish to have a sector length of say 2m or less, especially in corners, and when we would like to do a proper job. But it is as it is, and its good if we know this BEFORE starting to plan the exact layout of our dream track. Now we turn to the tougher business, the Angle. The angle is hard to understand, because it is NOT an angle value. I guess the mathematicians call this value CURVATURE (german: krümmung). It is a value, saying HOW MUCH a line is bowed. The higher the value, the tighter the curve. But when we want to know about the angle, we have to look at the length of curved line, and multiply. Now we really have an angle (unit: degrees; 360 degrees means full circle), in the track-change-dialog and in the track data table this product (angle x length) is labelled ARC, so if we want to know the angle of a curved sector, we do look in the arc-field in the track-change-dialog or in the acr-column in the track-data-table. In this example we see a straight sector, then a curved, then again a straight sector. 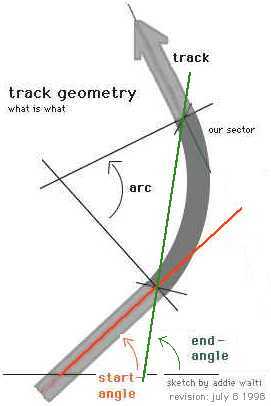 We are talking about the curved sector here. In this sketch you see what is meant by start- , endangle and arc-value of the track-change-dialog (the horizontal line at the bottom is the base line, 0 degree). Now we see the meaning of length and angle and we wonder how to translate the prefect corners on the map of our dream track into GP2- track-sectors. Because the grid of the length is that wide i guess we ever have to improvise, so probably the best way to work, is to underlay the map in the TE and then developpe the track by trial and error. We do underlay the map by generatin a bitmap, then calling the menu-function File / Underlay Bitmap, then fine adjustment of the underlaying bitmap in the track-tree, in the "Misc Config" section. In the GP2 tracks we call the real-life-height ALTITUDE. Somewhere in the world of your track you have altitude level 0, in real life we sometimes talk about altitude levels and mean the height above the sea. In that case the sea is at altitude level 0 and Mount Everest is about 8848m. Now if you have a gradient over a certain track section, the altitude level of the track changes. If the gradient is positive about e.g. 3 km then you are on top of a hill after that section. That means we have to go down again by the same amount, maybe with more negative gradient over a shorter section or with less negative gradient over a longer section. However, most important: at the end of our track we have to have the same gradient-value and even more important the same altitude level as at the beginning of the track. If we have not, the track works anyway, but we got a sharp bump somewhere around the s/f-line (actually there are even more subtle nasty things, but we want to leave the details alone here). The question is: how do we calculate the altitude level at a certain point of our track when we know just Height and Length ? Answer: basically we do NOT have to, because the track-editor is a great tool and does it for us. We just have to keep an eye on the columns Cumlative Gradient and Cumlative Altitude in the track data table. These two values tell us the gradient and the altitude level at the end of the sectors. The most important thing is: in the very last track-sector the two values have to be as close to 0 as possible. Actually a Cumlative Gradient of +/- 5 and a Cumlative Altitude of +/-50 will do fine also. Ok, i agree, this is tough enough to do, but after fidling around with the height values all over the track for e few minutes, i guess you will get it equalized. If you want to know exactly how the calculations work, you may want to have a look at the tutorial "How to edit the track height" of the same author. You find it in the tutorial section of the track editor homepage. But as i mentioned before, its not necessary to know the details here. As always in real life, there are limits in creating up- and down tracks. Sooner or later you will realize: there is a threshold for the altitude level value. 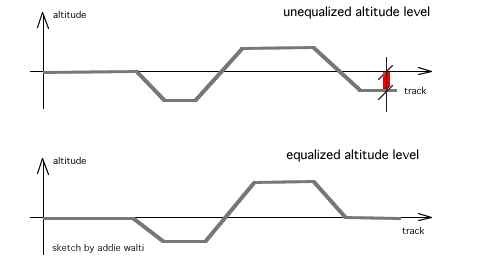 If you go beyond, you get over-or underflow, which means a wrap around in the altitude level, the deepest possible level changes abrupty to the highest possible level or vice versa. In the meantime we practice trial and error. Another important property of the track is its width. The track-width is controlled by track- (or pitlane-) commands. For details see the "Command Library" by the same author, commands 0x85 (133), 0xb4 (180) and 0xb5 (181). There you find a detailed description of the mentioned commands by Peter L Kessler. For choosing some road signs before a corner you may want to use the combobox in the "Road-Signs" section. It includes all the possible (at least the useable) combinations of the checkboxes in this section. It was ando <gp2@ando.de>, who opened my eyes on this one. There is also another way to get road signs: you can do it with objects. But there you have to place them completely on your own, on the other hand you have full controll about it. You think, the road sign combobox is genius ? Then watch the next one: in the Fences-group we also have two checkboxes 0x10 and 0x20. These are thought for BRIDGING fences. This term is maybe a little bit confusing, but its the only one i got. Imagine a straight, then a chicane, then again a straight. First straight is t10 (track sector 10), the chicane is t11 to t15, the other straight is t16. Now it would be a lot of work if we would have to determine all the verge width values of our chicane-sectors to prevent too many edges in the fences on both sides of the track. The easy way here is to check all the 0x10 and 0x20 boxes of the fences group of the t11 to t15. When we have done this, the end of the fences of t10 is connected DIRECTLY to the fences of t16. That means the fences of the t11 to t15 are SKIPPED or BRIDGED. 0x10 is for bridging the left fence, 0x20 for bridging the right fence. 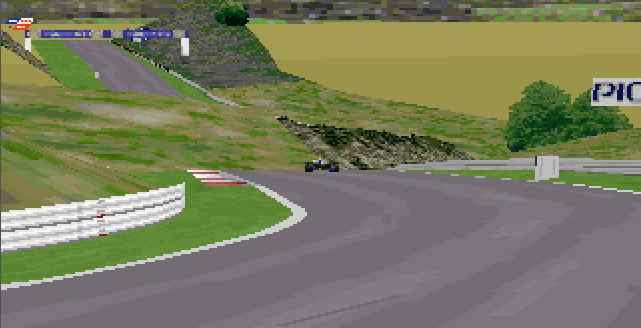 The following example is out of jerez (f1ct14.dat), the Ayrton Senna corner, t64 to t72. On the map you see the connected fences in red. The fences that are "removed" , are also shown (menu: show /removed fences). If you have a look at the track data table, you see that whenever fences are bridged, also the checkboxes Remove Texture of the Fences section are checked. These checkboxes do remove the texture of the appropriate fence. (But when a fence is bridged, it is hidden, it is gone, and with it the texture. So there is no difference whether these checkboxes are checked or not. But as it is done in all the original tracks, i suggest to do it also in your track). So, if you want to bridge the fences of some sectors, do check both the Remove Texture AND the Bridge Fence checkboxes. The two track-commands 0xca and 0xcb define the charcteristics of the two kerb types; A and B. These two commands appear only once each in in every track. Once again, for all tracks except F1ct16.dat, these are found in track section zero. For F1ct16, they are found in track section 6. It actually doesn't matter where within the track these are, but there's no need to move them anyway, so don't bother. If you place a second 0xca or 0xcb kerb command somewhere into the track, this will basically overwrite the existing command, such that kerb characteristics of this kerb type for the entire track will come from the new command, not the existing one. My advice; don't add, or move 0xca and 0xcb commands. You'll just confuse things. The two commands 0x8e and 0x8f are used to set the start position and the length of a kerb on a track sector/s. 0x8e is used for kerbs that appear on the left hand side of the track, and 0x8f for the right. These commands will only work properly on type B (0xcb defined) kerbs. With a type A kerb, when you set one the kerb will run for the entire length of the track sector. The only time when a type A kerb will need one of these commands is in the rare instance when one of these kerbs will not appear when you set one. For type B kerbs, how far the kerb will run along the track sector can be changed by these commands, and it is far more common for these kerbs to not appear when you set one, and these kerbs can be 'forced' as well. 0x40 sometimes checked in original tracks, but i couldnt get a glue what it does. The verge width is defined as the distance between the edge of the track and the verge (ie. the fence) on each side. Verge width, combined with track width (see TRACK WIDTH section), therefore determines the about of room perpendicular to the track that the cars, be they CC's or human controlled, have to drive around in. The values for verge width are found in the TRACK CHANGE DIALOG box. The two variables are LEFT VERGE; the distance between the left hand edge of the track and the left verge, and RIGHT VERGE; the distance between the right hand edge of the track and the right verge. Small values will give you fences that are close to the edge of the track (Monaco, for example, uses a value of 2 for each variable at most points of the track). Larger values will move the fences further away from the edge of the track (Useful for creating large runoff areas for sandtraps). The upper limit for the verge width values is 255. Verge width, incidentally, is not measured in the same units as track width. the verge width values that you enter define what the width will be at the END of the track section. The width at the START of the track section is the verge widths of the previous track section. The progression from one verge width to another is linear. On a straight track section, going from a verge width of 200 from the previous sector, to 100 for this sector, the fence be a straight line from the start to end of sector; there is no fancy curved progression. Basically this means that the gradient of the fence (left and right, not up and down) is constant. The only section where the verge widths have no effect is the LAST track section. From what I mentioned earlier, this should determine the verge width at the start of the FIRST section. Instead, the left and right verge values can be found in the track tree to the left. Open up the basic track directry, and then the TRACK CONFIG directory. Here you will find two values called BEGIN LEFT VERGE and BEGIN RIGHT VERGE. The values that you place in here will be the ones you wanted to place in the LAST track section. Verge width is always taken from the edge of the track to the verge, so that when you change the track width, the fences will move closer together or futher apart, but the distance from track edge to the corresponding verge will remain unchanged. Also note, that when you change the verge widths, you may have to make some changes to the object distances (see OBJECTS section, eventually...). The object distances are taken from the centre of the track, so changing the verge widths can cause objects to become too far away from the fence, or to be drawn within the fences. The height of the fences are controlled by track- (or pit lane-) commands. For details see the "Command Library" by the same author, commands 0x98 (152), 0x99 (153) and 0x9a (154). There you find a description of the mentioned commands by Nic "Swervin' Irvin'" Prins. Well basically banking is the simpelest of adjustments one can make (that says something about the rest...). Insert the command before the corner, insert the values and the banking is done. After the corner, insert another banking command to get the track straight again. Textures are handeled by a few track- and pit lane commands. How to deal with cmd 0xbc. a2: location code. we select a ribbon. a4: id of the texture out of a JAM-file. a6: hard to describe. Maybe we can call it resolution of the placeholder in vertical direction according to the texture. e.g. "HITACHI" mapped on a fence 3 times side by side (a5=3) in monaco, if a6=16. if p6=32 we have double the resolution on the placeholder so there is space enough for TWO ROWS of 3 times "HITACHI". p6=48 would be 3 rows, etc. in this example 16 is the half of the real vertical resolution of the texture. I dont know if its ever half the resolution. a7: vertical shift within the texture. If this shift is somewhat greater than 0 and less than the vertical resolution of the texture, then the texture gets shifted upwards by this amount. That means the upper margin gets cutted and pasted at the lower margin. a8: rotation of the texture in steps of 90degrees. When applying a texture to a fence/ribbon/verge, it may be upside down, or wanted upside down or turned. The code to do this is the arg8 - X angle, with codes 16,32,48 respectively, for 90-180-270 degrees rotation. (cost me some time to find out, typing 90 the first time, when you KNOW you are working with computercode, is quite stupid. The Doom-editing I once did helped me remind that EVERYTHING goes in powers of two.) The interface box on this command is pretty bad in 156, almost all changes are not working. Instead, I use the properties box which is difficult because the textures have no names, the places are just a number and so on. Not too difficult, but maybe more of a hint to Paul Hoad. Seems like a little bug in the TE. Also, the nrows is the number of rows of pixels on the bitmap that is mapped. Not the number of mapped bitmaps that you want on your ribbon. Some of you already have noticed, cc-line editing is a story by its own. There is a tutorial of the same author on this subject on its way to its public. Its still pretty raw, thats why its not yet published but the "brief introduction to cc-line editing" is available directly from the author. cmd: command. commands are included in track- or pitlane-sectors. They can be accessed in the track-tree. t99 or t99(99): track sector 99, its length in brackets. p99 or p99(99): pitlane sector 99, its length in brackets. c99 or c99(99): cc-line sector 99, its length in brackets. s/f-line: start/finish-line, thats where the end of our track meets the beginnig again, thats where the circle closes, and where time counting starts/ends. (? ): Because english is not my first language, and because my english dictionary is not that good, sometimes I am not absolutely sure about a used term. In that case i either add the german term and you may use your german dicionary. Or if I am a bit more sure, but not absolutely sure, I add a question mark in brackets. However, that means: I am sure about the fact, but not sure about the term. If I'm not sure about the fact, I say so, or the fact is not mentioned at all. -slight change in chapter "Verge Width" by Nic "Swervin' Irvin'" Prins. the maximum width IS 255. -chapter cc-line editing extended by explanations on the cc-line-editor-dialogbox. starting things off. first version mainly on the track-change-dialog-box of TE 1.5.6, track geometry basics and track-sector features. plus introduction to cc-line editing. Remember: the track works how you PROGRAM it, and not how you want it !